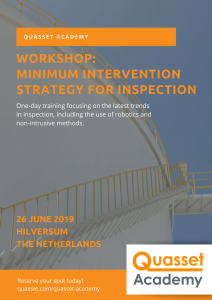 Martin van den Heuvel of MISI Consultancy will lead two specialized workshops on Minimum Intervention Strategy for Inspection. In this interactive training, participants will learn how to apply non-intrusive inspection where possible, replacing human entries for inspection for robot inspections as well as reducing scope for turnarounds by optimizing the use of risk-based inspection analysis. The workshop also focuses on exploring the latest developments in the field of Robotics and Non-Intrusive Inspection. The development and implementation of MISI has resulted in cost reductions for shutdown related inspection work of up to 50% and significant reduction of confined space entries. Both workshops will be led by expert Martin van den Heuvel, an international innovation and inspection strategist with a long track record working with large petrochemical companies. Van den Heuvel is the founder of MISI Consultancy, delivering services for the improvement of maintenance and inspection strategies with a specific focus on MISI, a Minimum Intervention Strategy for Inspection. The Minimum Intervention Strategy for Inspection workshops are especially developed and suited for asset managers, maintenance managers, maintenance and reliability engineers, shutdown managers, inspectors, supervisors, managers of transport pipelines, and other specialists who work in the petrochemical industry. Sign up today for the Inspection Strategy 4.0 one-day workshop on Wednesday 26 June 2019.